I decided about .2 milliseconds after we got engaged that I didn't want to wear a veil. I do think they have their place in bridal fare, but they aren't really my style. 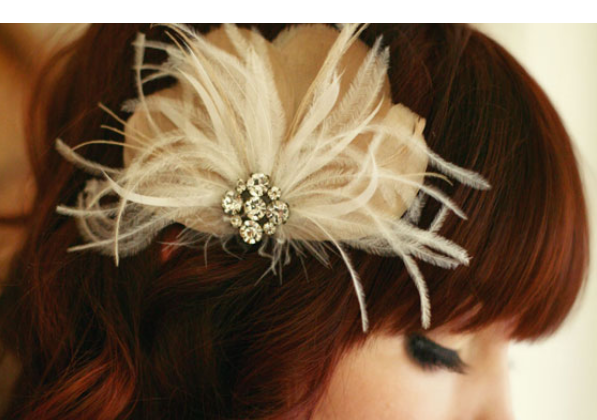 I do, however, fancy the idea of a beautiful hair accessory or headband. 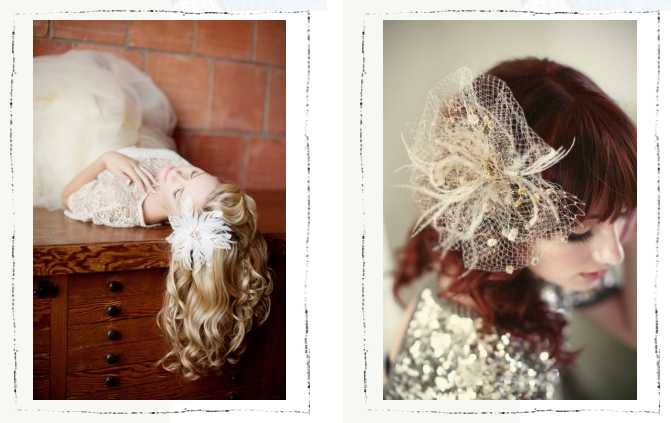 There seems to be an unintentional recurring theme of "vintage" cropping up in all of our inspiration photos for the wedding, so I really think a 1940's inspired headpiece might be just the ticket. I think I've blogged about this vendor once or twice before, however I couldn't help but revisit their site today to oogle their goodies. Meet the loveliness of Lo Boheme. 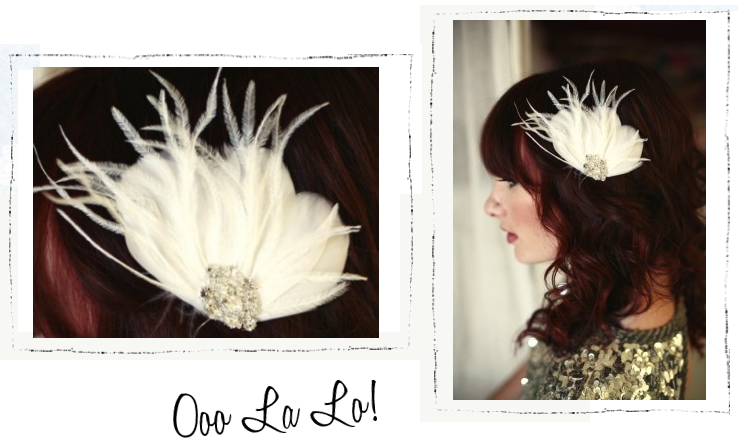 From hair accessories to veils and garters, Lo Boheme seems to carry it all. Even if you aren't a budding bride, they have amazingly constructed couture headpieces, jewelry and more, sure to spice up any outfit. I was immediately drawn to this one, the Claudine Bridal Hair Facinator. I have a fetish for feathers and its not-overwhelming-but-big-enough-to-get-noticed size fits my style to a "T". And tell me, what girl wouldn't want to wear something in her hair called a Facinator. I also fell head over heels for the gorgeous garter collection offered by LB, as well. I'm about 99% sure I'll be placing an order for the Cass Bridal Garter in ivory this weekend. Whatver you're doing or wearing this weekend, please go make it a good one, m'kay? I'll see y'all back here on Monday morning. 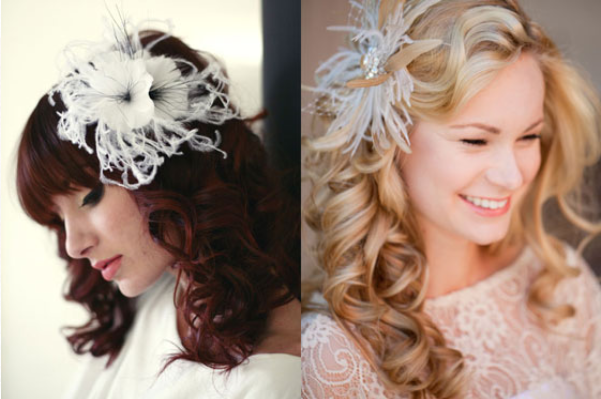 those hair pieces, you're going to be a stylin' bride! You MUST check out Twigs & Honey too... They've been featured on Style Me Pretty and Once Wed. Their stuff is absolutely beautiful. I will do just that! Thanks Lo!! Oh my goodness, every single one of these pictures is beyond beautiful! I can't wait to see what you pick out! I said no to a veil too. Not my style and so dated. I actually had nothing on my head at all. I love the feathers in the hair instead of a veil...gorgeous and unique. And that garter is stunning!! You must get it! Love those hair pieces! I am getting married this summer and I also decided that I didn't want to wear a veil either... I did however decide that a detachable birdcage veil! It's so cool! A little birdcage veil with a beautiful floral hairpiece for the ceremony,then remove the veil, and keep on the hairpiece for the reception! I love it! Hope that your planning goes well! Isn't it fun!!!!!??? Hair pieces/clips are fabulous! I'm more of a traditional high- as-the -sky veil wearing type of girl...but these are so pretty! I'm with "Across the pond"...the birdcage veil with a hair piece are sensational (and the veil can be taken off after the ceremony) Love it! Everything is so delicate and feminine! Love the first pieces the most and I think with your little Southern pouf (as I like to refer to it) would look so sweet in a low chignon with a hair piece right to the side. Classic! Love these hair pieces! You are going to be a gorgeous bride! one of my girlfriends is getting married in june and she's wearing a big flower and feather mix in her hair and each of us bridesmaids will be wearing a smaller version of that! too cute & stylin! I love that! I'm not planning a wedding but I sure do love a good head piece... not a fan of veils either. Great job wedding planning! You're such a doll. How great! I love the idea of a head piece but not a veil! I am sooo with you on the no veil thing! Those hair pieces are perfecto! which makes me a very happy little lady. Great GREAT little blog you have here! I love hearing about your wedding choices! I can't wait to see how it all comes together!